Helloworld Merimbula are a trusted local travel agency located at Shop 3 Centre Point Merimbula. 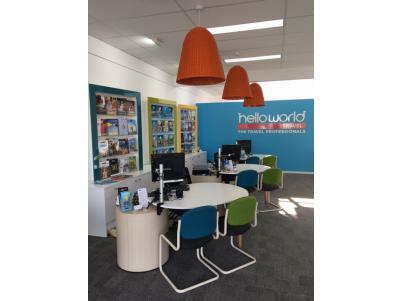 Plan your next holiday with Jill, Lauren and Trish at Helloworld in their new location shop 3 Centre Point Merimbula. The team at Helloworld will plan your holiday as though it was their own. Helloworld Merimbula (formerly Harvey World Travel) has been locally owned and operated by Jill Warnock for over 17 years and have just relocated to Shop 3 Centre Point Merimbula. The team at helloworld Merimbula love to travel and are passionate about providing you with impartial advice and our personal knowledge. We will offer you value pricing and face to face service. We’ll plan your holiday as if it’s our own. We provide all our travellers with an emergency assistance number offering 24/7 support. Helloworld Merimbula are ATAS accredited. Known for their love of travel, impartial advice and personal knowledge, book your holiday with the experts - if they haven't been somewhere, there will be someone in the Helloworld network who has!